The roots of Jiujitsu go back over 2000 years and are deeply embedded in Japanese history and tradition. JiuJitsu is a Martial Art originally developed by the warrior class (the Bushi) of Japan and as part of the classical bujutsu it is defined as the Martial Art of Flexibility. 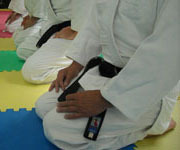 This means the flexible or efficient use of balance, leverage and body movement in the performance of Jiujitsu techniques. It also means flexible in any or all situations. A Martial Artist who can combine or blend techniques to suit his/her needs is on the road to mastering the Art of Flexibility. The Martial Arts of Judo, Aikido, Aiki Jutsu, Hapkido, Nippon Shorinji Kempo and some systems of Karate-Do all have their roots in Jiujitsu. JiuJitsu is a family recreational activity that can be enjoyed by men, women and children. Characterized by strong kicking, punching, throwing, standing controlling and ground grappling techniques Jiujitsu has earned a reputation as an effective and formidable self defense Martial Art. Although some clubs organize their own competitions the C.J.C. does not officially sanction Jiujitsu tournaments or international championships. We have observed that they are extremely expensive, time consuming and stressful for the competitors and officials and only a limited few members benefit. The C.J.C. concentrates on developing principles techniques and strategies of scientific self defense. Our goal is to provide opportunities for physical and mental development leading to personal growth, greater self reliance and vital health.